Bangle shops are very catchy and attractive aren’t they? And we see a lot of them during festive seasons. Mr.Abhilash (a bangle seller from Kottarakara, Kerala) shares with us, why he came to Amritavarsham’64. He first came for Amma’s darshan 6 years ago with his friend Ratheesh. Abhilash didn’t have any idea of why so many people were following Amma and neither did he find any relevance to it. He says “I saw the long queue waiting for Amma’s darshan, I kept looking at Amma when She spoke to each person and during every interaction, She remains pleasant and calm. I wondered how she remains so energetic the whole day! It was my turn then- I couldn’t explain what my feelings were, she hugged me and said that happiness comes when you feel you do the right things (that is, when your conscience is clear). I felt refreshed” Amma seemed to have answered the question in his mind! 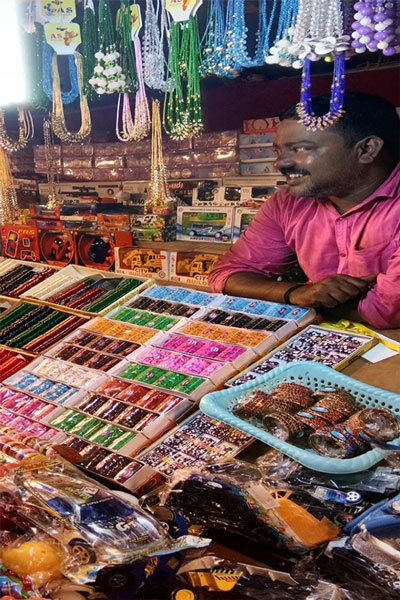 Abhilash puts up his bangle shops in Kottayam, Kollam, Ernakulum and Trissur during several festive seasons. “I have been coming to Amritapuri since 2012 and setting up my stall during the occasion of Amma’s birthday. Every time when I come back during Amma’s birthday I still remember the first darshan I had” says Abhilash.